The real value of Conqueror’s Haki could be revealed in any chapter now because Luffy is in a situation where he must learn it to have a shot against Kaido. This post assumes the positions I hold in a previous Haki theory. All 3 Colors of Haki have 2 layers. 2nd layer: You can control objects which includes destroying them. 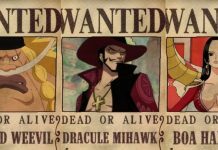 (Shanks, Big Mom, Kaido,?) We have seen Shanks destroy structure with it and Rayleigh opening Camie’s collar. The extend of this will be part of the theory and how it manifests physically. Without further a do, let’s go! Its been over 3 months and we are still in Wano and Luffy is still in prison. Nothing much happened, right? Well sorta, the latest chapters shook the community up a little bit. 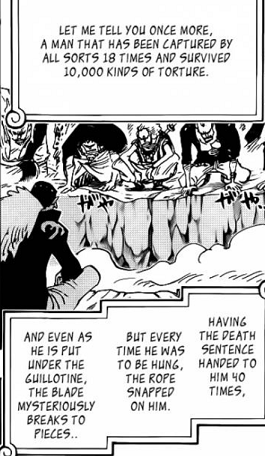 Going so far as to state that Oda is changing the rules for plot purposes. I am talking about the properties of sea stone cuffs and that they drain the strength of Devil Fruit users to a point where they aren’t able to perform Haki any longer. For me personally this is something I was waiting for and wanted to be resolved prior to the scene. The same issue has been introduced some time ago and I think its time to address it properly. From a story perspective Luffy will be the one to become Pirate King and we are following his journey to succeed in this endeavor. He will necessarily have to be world class level strong. Maybe even the strongest, but it isn’t too important to specify. The point is that Luffy will learn things every arc from now on and those he can’t defeat he has to take on multiple times. We have already seen this with Crocodile where he needed the first defeat to find his water weakness. The same can be said when he learned Gear 2 from observing Rokushiki. Going so far as to the Whole Cake Island arc where he learned future side(layer 2 in my theory) against Katakuri. There still remain two things that we know exist in haki that can be achieved. It is the 2nd layer of Armament and Conqueror’s Haki. He needs those abilities to become the best, this is the potential we have encountered prior and anything beyond that is only limited to Oda’s imagination. 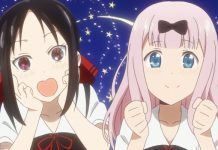 And what is currently happening in the series? Luffy is in exactly the right situation to learn the secret. 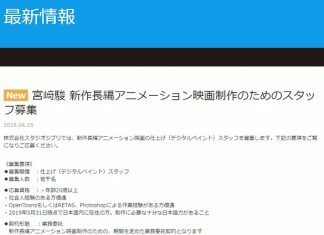 It is a secret that has been introduced with the person who accomplished the usage of the 2nd layer of Conqueror’s(controlling objects) and Armament(permanent invisible layer of protection) Haki. How is Kaido that impenetrable so he can’t be pierced and even tries to kill himself as a hobby? We have encountered this ability in Big Mom right before the current arc. She was always durable like a metal balloon unless she was in shock. At this point we still didn’t knew if Kaido was a devil fruit user but we assumed he is because he was called 1000 beast Kaido, looks like a beast and is building a zoan army. Later on it was revealed that Kaido in fact can turn into a dragon but their lies the entire problem that I awaited to be resolved. How did Kaido survive the torture? How is it possible that if he was cuffed in sea stone (which we can safely presume because that is what the world government is doing for years) able to survive? How did Kaido survive all those 40 execution and 10.000 kinds of torture? What is the cause of his secret? 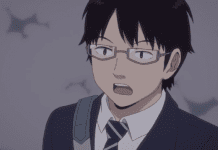 It is Haki. 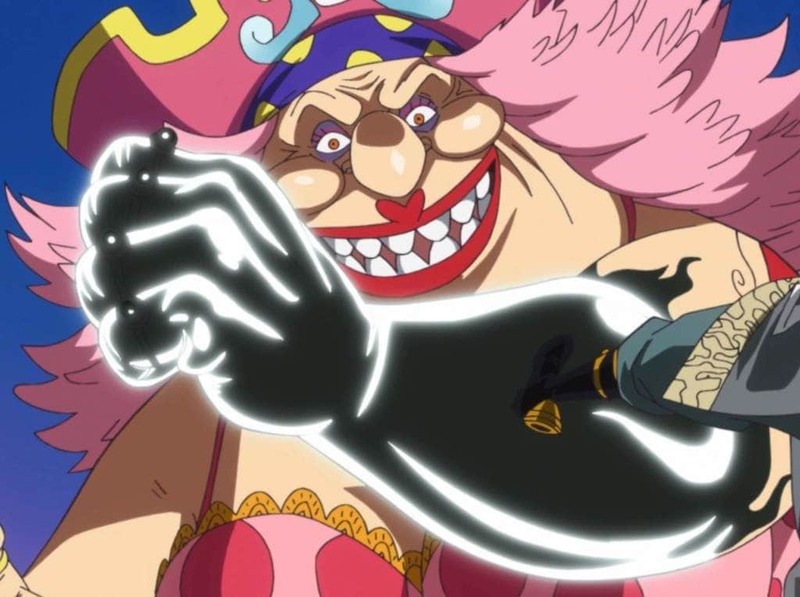 One reason being that Big Mom(a Yonko) also shares this ability of being impenetrable, it isn’t unique to Kaido. 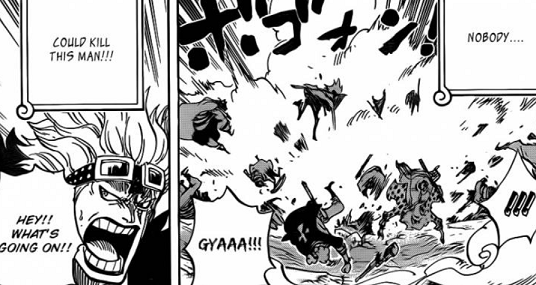 We can also conclude this from precedent, we haven’t yet encounter an instant in the entirety of One Piece where an attack is launched with haki that lost against a non-haki attack. Their is a reason why all the strong posses this ability. Some tribes learn it at an early age but generally, this is true. 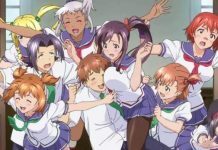 They all posses it or they wouldn’t be one of the strongest. Maybe the only exception is Blackbeard but he is a unique case and we still don’t know if he has mastered Haki. As an example, Luffy can one shot giants(who are bigger than Kaido) with a gum-gum-pistol by coating his hand with Armament Haki. The precedent is clear that no matter how durable you are naturally, you will lose against a super power like Haki. 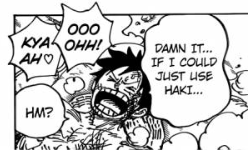 In Luffy’s encounter with Kaido he has finally noticed what he is lacking when it comes to haki. Kaido’s secret enables him to take Luffy’s physically strongest attacks that use haki like they are light punches. Luffy already experienced the same phenomenon in his clash with Big Mom and can conclude that this form of haki exists. Now he met the second person who possesses this ability and that it must be haki(haki always wins against non-haki, Kaido must have used haki). Let’s return to the problem. We now know that Kaido could survive torture/attacks like its nothing and he is impenetrable but how could he have used Haki? We got told that the sea stone cuffs drain the strength of devil fruit users to a point where they can’t use haki but Kaido is a devil fruit user(like Luffy). Their is no precedent in the series were someone is able to change species at will without the usage of devil fruits. This problem is directly connected to Kaido’s secret. Luffy is now in the same situation that Kaido was in. He just fought him and learned about the existence of the secret. In order for Luffy to be able to fight Kaido he has to accomplish this. This isn’t some sort of plot hole but the point of the story line that Luffy is currently on. He is thrown in a situation we know Kaido was in and has survived, now its turn for Luffy to survive. Luffy’s is mirroring Kaido’s path. But their is one more thing that Luffy learned during their fight and it involves the ring that explodes around his neck. I talked about the 2nd layer of Armament Haki up till now but their is still the 2nd layer of Conqueror’s Haki. 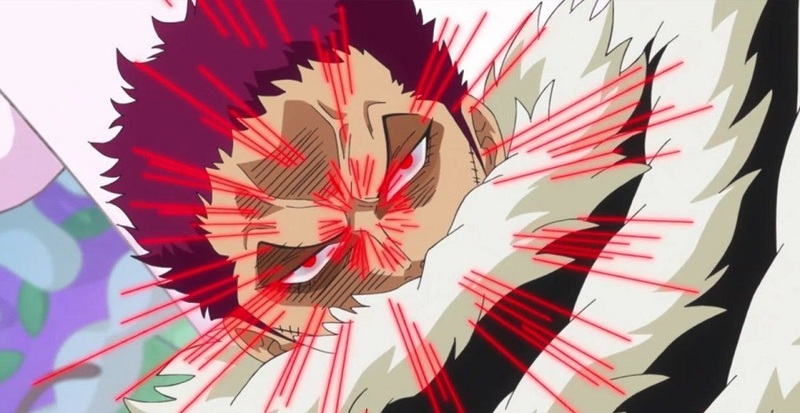 Many people believe that when two Conqueror’s Haki clash black lightning is emitted. This isn’t entirely correct, single individual can and have used black lightning without a conqueror’s clash occurring. And what is the black lightning?It is the physical manifestation of the 2nd layer of Conqueror’s Haki which enables you to control objects. Well, what did Luffy against Kaido? Oda finally revealed to us what you can do with the usage of Conqueror’s Haki in combat. This is one of the longest standing secrets in One Piece. Why is Conqueror’s Haki one of/if not the most feared ability? Even admirals like Sengoku fear this ability and know its true potential. Everyone is impressed by seeing a Conqueror’s user but it appears just to be a “meh” ability. 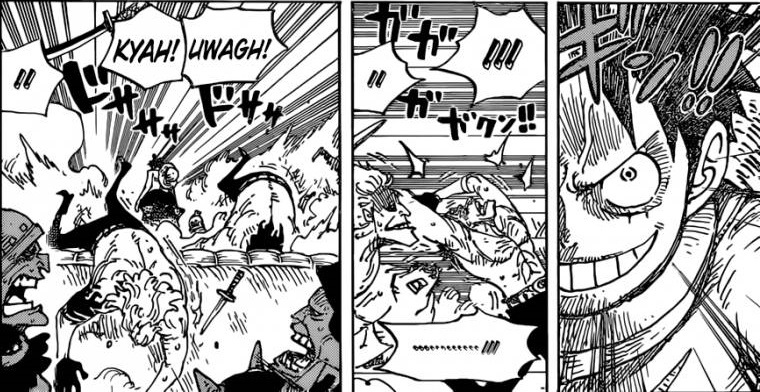 Knocking out weak enemies isn’t a skill that Luffy even needs. It is kind of redundant and only cool looking. It has too have a secret which enables you to use conqueror’s haki in combat against strong enemies. Luffy tried to add the usage of Conqueror’s Haki in his attacks but he still didn’t used its full potential. Now we finally know what the true value of Conqueor’s Haki is. Black lightning is the control of objects(2nd layer) and is coating Kaido’s club. Also, take a look at the name of Kaido’s attack with that in mind. It is called “THUNDERclap” which refers to its usage of black lightning. 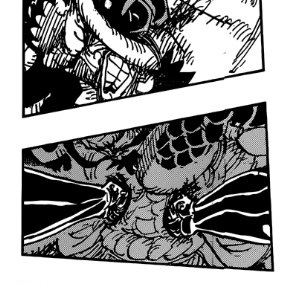 Oda even showed us the importance of this move by letting us know that Kaido has been using it consciously. Look at the top left panel, his weapon is coated in black lightning. After Luffy is defeated and falls to the ground it wears off, he deactivated it. And we have an indication that Luffy has seen this, he has the 2nd layer of Observation Haki which is future sight. He probably saw the black lightning used in advance and had a clear look. Luffy fought now two people with the 2nd layer of Armament and Conqueror’s Haki, He noticed that he had no way of hurting them, he got defeated with a single attack that has used the 2nd layer of Conqueror’s Haki and now has an opportunity. The entire fight was about those two things. Luffy being unable to hurt Kaido at all and him being one-shotted by Kaido. Though, let’s return to Luffy’s imprisonment. If you have read this theory you know Conqueror’s Haki enables you to control objects and Rayleigh was able to remove Camie’s collar with this technique. It opened up by itself. Luffy’s sea stone cuffs are gone but it is quite possible he will get them on again because he knows that he has to improve to become better. He already indicated that the sea stone cuffs will make him stronger. 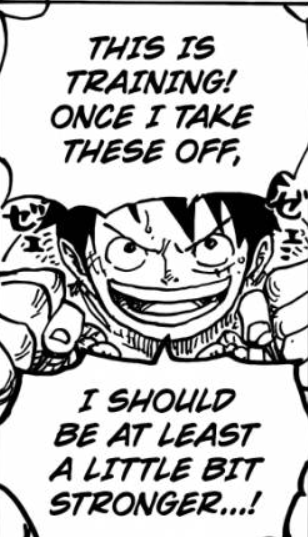 A bit tongue and cheek but why would Oda mention this and then suddenly remove his cuffs? They still have to be relevant in some way. Now we can speculate a little and predict what will happen. First, how do you achieve the 2nd layer of Armament Haki? I am not set on anything but if I would have to take a guess, I would say that you have to look on how you loose this protection. What am I talking about? 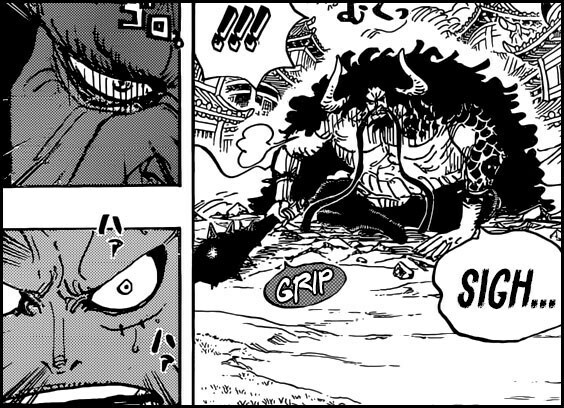 Oda revealed to us how Big Mom loses her haki protection, it is when she is in a state of shock. Coincidence and a one time event? 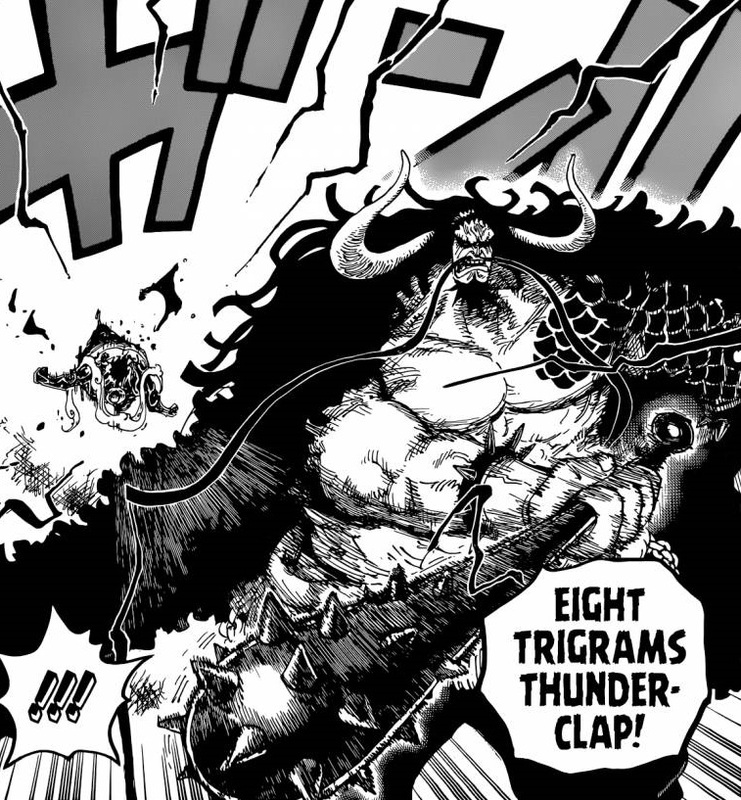 I don’t think so, I think Oda didn’t made this a plot point right before Kaido by accident. This is relevant to Kaido’s secret. What is the opposite of being in shock? Being perfectly calm to a point where you don’t even have anything on your mind. If the emotional state of shock disables your Armament Haki, that means in reverse that being perfectly calm and collected enables you to do it. Which is funnily enough the same way you are able to achieve future sight(which is another 2nd layer) and Luffy probably hasn’t realized this yet. Once he does though, he can start developing it and ultimately be able to use haki in sea sone cuffs. Luffy will also have noticed that you can open collars with Conqueror’s Haki because he knows Rayleigh did so already. 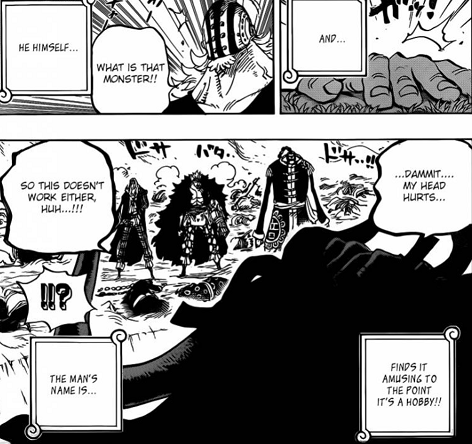 He might have even told him about it and we see a flashback, this is something Luffy very likely is curious about and possibly asked Rayleigh. 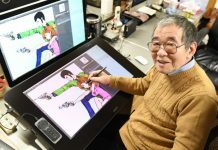 So he knows it is possible with haki to remove that collar by controlling objects. These are my two cents about the current Luffy story line and how things are turning. 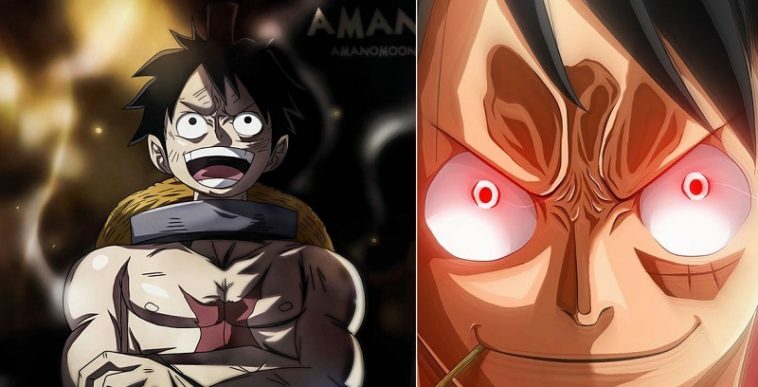 Kaido’s secret and strength and how Luffy will be able to reach it is what the imprisonment story line is about. Cheers. Previous articleLuffy’s Advanced Armament Haki to defeat Kaido!